Aid Group Pulls Out Of Nigerian Town Following Deadly Suspected Boko Haram Attack : The Two-Way Tens of thousands of displaced people living in a nearby camp are now deprived of medical care, said Doctors Without Borders. Three aid workers were among those killed. 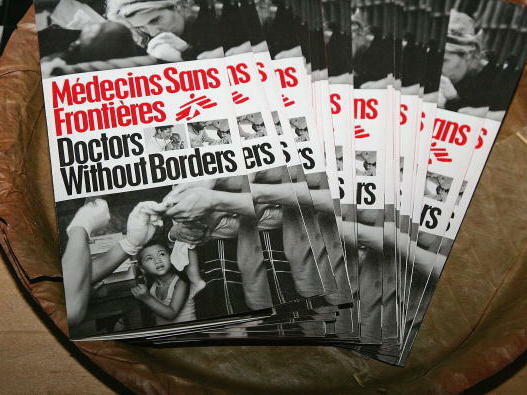 Pamphlets on display at Doctors Without Borders. After suspected Boko Haram militants launched a brutal attack in the town of Rann in Nigeria's northeastern Borno State Thursday, killing several people including aid workers, Doctors Without Borders has pulled out of the town. The departure is sure to be a blow to the tens of thousands of displaced people living in a nearby camp. "Prior to the attack, the roughly 40,000 people living in Rann were relying almost entirely on MSF's services to access health care," the group (also known by its French name, Médecins Sans Frontières, or MSF) said in a statement. "Leaving our patients, which include 60 children currently enrolled in our nutrition program, without medical assistance, is an extremely painful decision," said the group's Emergency Coordinator in Nigeria Kerri Ann Kelly. Doctors Without Borders says it will return as soon as conditions allow. On Thursday just after 5 p.m. local time "a large number of Boko Haram members armed with automatic weapons, rocket propelled grenades and gun trucks attacked the military base in Rann," said the U.N.'s International Organization for Migration. Eleven people were killed, according to IOM staff, including four soldiers, four police officers and three humanitarian workers. The U.N.'s humanitarian office says two of the aid workers were contractors working with the IOM to help those in the camp. The third was a doctor consulting with UNICEF. "Aid workers put their lives on the line every single day to provide emergency assistance to vulnerable women, children and men," said the U.N.'s Humanitarian Coordinator in Nigeria Edward Kallon in a statement. "Boko Haram's recent cowardly attacks have only renewed the determination of our government to bring the insurgency to a decisive end, in the shortest possible time,"said Nigerian President Muhammadi Buhari on Twitter. "I sympathize with the United Nations and other humanitarian agencies working in Rann, Borno State." Boko Haram's recent cowardly attacks have only renewed the determination of our government to bring the insurgency to a decisive end, in the shortest possible time. I sympathize with the United Nations and other humanitarian agencies working in Rann, Borno State. Since 2009, the Boko Haram uprising centered in Nigeria's northeast, has wrought widespread devastation. The U.N. breaks down the numbers: more than 20,000 people have been killed, some 2 million people have fled their homes and more than 7 million people — mostly children — are in need of humanitarian assistance. Boko Haram roughly translates to "Western education is a sin" and has been designated as a foreign terrorist group by the U.S. Department of State since 2013. But for nearly a decade, the militant Islamist group has carried out brutal attacks in a bid to create an independent state within Nigeria. The U.N.'s humanitarian office says a female nurse is missing following Thursday's attack and the fear is she has been kidnapped. Meantime, the more than 100 girls snatched nearly two weeks ago from their school in the town of Dapchi neighboring Yobe State are still missing. On Friday, Alhaji Lai Mohammed, Minister of Information and Culture said "more urgency" has been added to the search, which has expanded to neighboring countries. Nearly four years ago, Boko Haram kidnapped 276 schoolgirls from Chibok, in Borno State. A Twitter campaign to bring them home went viral. Today more than 100 remain missing.